“Naked I came from my mother's womb, and naked shall I return. Why did you stop knitting? Have we been forgotten? Why me/why not me? Why wasn’t Thomas given a longer chance on earth? Why didn’t I get to know Thomas like I got to know Simon and Teddy? Why couldn’t I have a rowdy house full of three healthy boys? Why has my husband been robbed of three sons on earth? Why did you give and take away? Did my Thomas have red hair like my other two boys? How is it possible I can produce this many tears? What are you calling me to do? Is Teddy my only biological child on earth? What if I didn't have your hope? When will you return and put an end to suffering? With each of these questions I am reminded they can all be answered through these four words: Ought, is, can, and will. The way life ought to be with creation in perfect relationship with God and other people. For us: Teddy and Simon in our home and Thomas in the womb growing big and strong. The way life is with corruption and the fall. Our lives here do not line up with God's original plan. For us: Simon and Thomas separated from us for a period of time. The way life can be because of redemption. God offered Jesus as a solution for our fallen world. For us: We are thankful for the life, death and resurrection of Jesus Christ where we find freedom. The way life will be. Through restoration the bible tells us of the new heavens and new earth. For us: The city we long for where we will be in direct communion with Christ and our loved ones we have been separated from. As my friend Kylie listened to me sob asking, "Why did God stop knitting?" I believe the Spirit led her to a sweet thought in that moment. She said that because of The Fall (as in, man's original decision to separate from God in Genesis 3) God only has so much tattered yarn to work with for each one of us. And it wasn't so much that God stopped knitting but that the strand of yarn ended and His work complete. Her profound words spoke to my desperate heart. Sweet tiny Thomas, I am honored to be your mommy. I have known other mommies who feel like carrying a baby until miscarriage was a waste of time. Thomas, you were most certainly not a waste of time. You made me a mommy for the third time. While I long to know you and to feel your body move with life, I now wait to touch you again in Heaven someday. Carrying you for 14 weeks was a gift. While I have empty and alone moments, as you have left my womb prematurely, I know I am not alone. God is with me and he will use our suffering for good. Thomas, I pray your life will be used, like your big brother Simon’s life, for the unborn. I was so silly for thinking I wouldn’t want to walk a similar walk to Simon’s journey ever again. Oh to carry you for 22 more weeks and hold you for a week. Just one week! That would've been an amazing gift and I would have much rather had one week with you then give you away at 13/14 weeks gestation. Your short life, Thomas, has made Simon’s life all that more significant and miraculous. I look forward to God revealing the ways he is using your life in the days and years to come. Although I hoped that you would see daddy and me first, I can't fathom what it was like to open your eyes and see Jesus first. Welcome home, Thomas. Enjoy your time with your big brother Simon. We love you so. Lord, you know my thoughts before I do. My faith has waivered and I have felt forgotten. Forgive me for doubting any part of your plan. God, you have prepared me. My mind knows the truth and my heart is catching up daily. I am not forgotten. You are holding me in the palm of your hand similarly as I did our sweet little boy Thomas - I love Thomas so much but you love us both infinitely more. Thank you, Lord, for being my rock. Thank you for reminding me I don’t have to do this alone – I don’t need to be a rock. Adam doesn’t need to be a rock for us either. You are our firm foundation. We can’t do this alone. Losing Thomas the week of Thanksgiving was on your time. What a special week to remind us of our blessings. While we are thankful year round – thankfulness and kindness surrounded us as we mourned and continue to mourn and for that I am grateful. Again, I see your work and craftsmanship surrounding timing. Thank you for revealing this perfect timing to me. I feel both blindsided and prepared for another hardship. You haven’t fully prepared me, otherwise I wouldn’t need you. I promise now as I have before that I will proclaim your goodness in everything; even after delivering death. Thank you for our fertility. You have blessed us so far with “easily” getting pregnant. I pray for another pregnancy someday that will end with a full term healthy baby who comes home and outlives Adam and me. Until then, Lord, please allow us to have “normalcy.” Allow us to “be” with Teddy. We look forward to normal days with less grief and mourning. We are tired, Lord. Remind me to rejoice in our present blessings. Let me enjoy my little boy, Teddy. Don’t allow me to forget the sweet miracle that he is. Let Teddy see me bowing in prayer more than worrying. I know you have spared us from many things we aren't even aware of - thank you. You promise to protect us and watch over us and I know you have done this; you are doing this; and you will do this. You don't promise to shield us from all tragedy but promise to shield and protect us as we walk through tragedy - in our case, death upon death. I know you will come through for us Lord and also recognize your plan looks different than I imagined. Help me focus this season of our lives a with a heart of gratitude and not self pity. When I begin to commit the sin of comparison, stop my wandering thoughts. Don't allow me to compare my circumstances to anyone else's and fall in a trap of either pride or misery. Focus my thoughts on what I have, not what I lack. Finally, God, use our lives and our son’s stories for your glory - give purpose to this suffering. You reign supreme. I long for your return, to settle the score and make all things new. If you would like to meet Thomas through photos, I welcome you to click on this link where I have shared a few images of him. Thomas was 13 weeks gestation and of course, not born alive. I see Thomas when I look at Teddy. I think it is a miracle that Teddy and Simon were once Thomas’ size – I can’t believe we were all that tiny at one point! 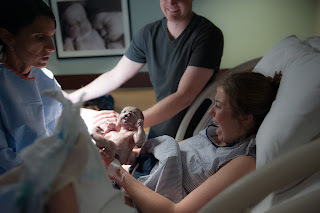 Many who have asked to see Thomas' photos didn't realize how miraculous a 13 week gestation baby was (the BabyCenter emails and images don't do justice to these tiny bodies), so I share respectfully in this private link above for those who desire to view. My hope it not to shock but to bring awareness to how quickly our babies' bodies form. Thank you to all who are checking on us. We are doing surprising well. I don't know why I am surprised each time by God's continuous gift of grace. I am very much struggling with not being pregnant anymore. The longing for another baby (with such a beautiful due date) in our home seemed so perfect. I was beginning to imagine getting out Simon's crib that we never got to use, shopping for baby clothes, finally getting the second chair attachment for the stroller, and hearing the pitter patter of new hands and feet on our floors. From our experience with Simon's life and death, the further we get from the epicenter of the initial shock grief the easier it is to see and think more clearly. So for now we live by faith and wait for God's wisdom to show us what to do. Last but certainly not least to you, Adam. Thank you for working so hard outside of our home so I can stay home with Teddy. There is no better therapy for my broken heart.